M.A.C.A.W. - Madison Area Cagebird Association of Wisconsin - Welcome to M.A.C.A.W. Are you interested in learning more about what your birds needs are, what hazards lurk around the corner, how to tell when your bird is ill, or who to go to if your bird becomes ill? Do you have a bird sitter when you go on vacation? Do you need to find a good avian veterinarian? Do you just have a question? MACAW offers education, entertainment, opportunities to get involved in the avian community and discounts on bird supplies at many of our local pet stores. Did you know that some birds can live to well over 80 years old? Do you have a Will that takes your bird's welfare into consideration? Birds like to have toys, to have company and enjoy spending time with the flock. Pellets are healthier than seeds. Clean water and food along with their dishes help to prevent bacterial infections. Keeping your birds indoors reduces threats from diseases like West Nile. Teflon, zinc, scented candles, smoke, ceiling fans, lead, and electrical cords are some household hazards to keep your birds away from. How would you like to learn more? Get involved with MACAW. 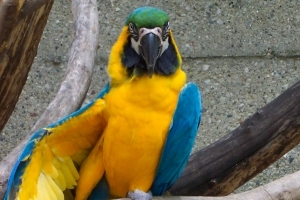 MACAW is the Madison area's premier bird club for people who have finches to macaws. We hold educational meetings 10 months a year, raise money for various avian causes and offer many opportunities to get involved, participate, learn and have fun. We are all friends with a common interest here where everyone is welcome. The Madison Area Cagebird Association of Wisconsin was organized in 1983 by a small group of dedicated cage bird owners and breeders. They envisioned rapidly growing interest in cage birds of all types and the need to further educate breeders, pet owners and the public on appropriate care, nutrition, health, housing, breeding and training. In 1986 M.A.C.A.W. was incorporated as a non-profit, charitable educational organization. One fund-raiser is our annual Bird Seminar. Money raised from this event goes to universities and other groups actively engaged in exotic bird research on diseases, breeding behavior studies, and conservation programs. Leaders of the club are elected by the membership at the annual meeting held in December. Join MACAW today, and help us help birds. Included are a President, Vice-President, Treasurer, Secretary and up to eight board members. These representatives meet monthly to coordinate the activities and expenditures of the organization. Additionally, the Board appoints committee chairpersons for such duties as organizing the Bird Seminar, Education Director, Historian, Librarian, Newsletter Editor, and Membership Director. Learn something new, get involved, have some fun. MACAW is dedicated to educating those interested or active in aviculture; improving life for all cage birds; helping preserve threatened or endangered birds in their native habitat through donations to their cause; promotion of captive breeding programs; and advancing the health care of all cage birds through support of avian research.